Like Facebook, WhatsApp is a very popular instant messaging app. In such a way, WhatsApp Call Recording is a very useful feature for WhatsApp users. By default WhatsApp don’t provide call recording feature for Android or iPhone users. In this guide you can learn how could you easily use WhatsApp call recording feature at your Android or iPhone. 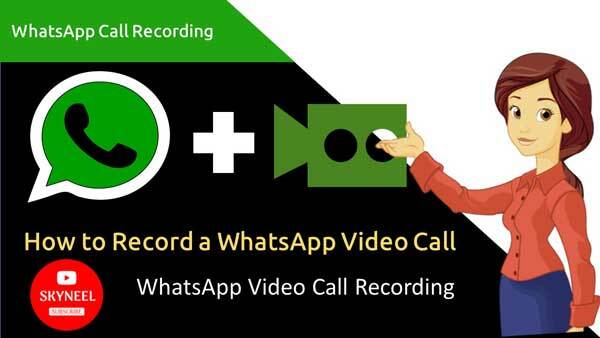 This is a quick guide from which you can easily record a WhatsApp video call. WhatsApp calling feature has been used by most of the smartphone users, but sometimes the situation arise infront of you during attending online interview and you need to record WhatsApp call. Most of the person don’t know how could calls be recorded on WhatsApp. Today we will tell you through this WhatsApp trick how you can record WhatsApp calls on your Android and iPhone. There are lot of third party apps available on the Google Play Store that claims to record WhatsApp video calls. Most of these third party apps are not working properly. Sometimes it is necessary to record few important WhatsApp calls made by people. But how can this work to be done? Today we are going to tell you, a simple WhatsApp trick which allows you to record WhatsApp calls on Android and IOS. Let us tell you that it is unethical and illegal to record calls without the permission of another person. In this case, if you want to record a call from another person, then definitely share the information with the person regarding the call recording. How to record WhatsApp Call in iPhone? Step 1: First you have to connect your iPhone through a data cable of Mac. If you are connecting first time then just tap “Trust this computer” option. Step 2: Now, open quick time option and click on the “New Audio Recording” option from File menu. Step 3: After that you have to go down in Quick Time and tap on the iPhone, and press the record button. Step 4: Now you have to make WhatsApp calls in your iPhone, as soon as you connect, you have to hit the record button. Now, you can record the WhatsApp call. You can disconnect the connection once the call is cleared, after that stop recording and save the file. How To Make This WhatsApp Call On Android Devices? Let us tell you one thing that, it is not possible to record WhatsApp call in any Android devices. If VoIP (Voice Over Internet Protocol) feature has been given in your device, you will be able to record call at the same device. Step 1: First of all, you have to download and install a third party app called Cube Call Recorder from Google Play Store. Step 2: After this, open the app and switch to WhatsApp. Now call to them whom you want to talk through via WhatsApp calls. After this, you will see that calls are activated in the cube call recorder, that means call recording feature is working at your phone. Step 3: If the call recording does not start and you will get an error message, then open the cube call recorder app again. This time you have to go to the ‘Settings’ section of the app and here you have to click on ‘Force VoIP’ in the voice call. Now, Call again with WhatsApp and check if the cube call recorder’s icon is showing or not. If your phone still shows an error message again, that means it is not working at your phone. Some Android users try to root his smartphone to use this feature and use SCR Screen recording app for call recording. But this is not a safe method as per the security concern. We will not recommend you to root your phone for using WhatsApp call recording feature at your Smartphone. So, you have to try given above methods to WhatsApp call recording on Android and iPhone.